MHS is comprised of the Wadsworth–Longfellow House and Longfellow Garden, the Maine Historical Society Museum and Store, the MHS Research Library and the Maine Memory Network. Click here for house and museum information, hours, and historical background. The 1786 Wadsworth–Longfellow House is the childhood home of Henry Wadsworth Longfellow, 19th–century America's most famous poet. Maine Historical Society opened the house to the public in 1901, making it the first historic house museum in Maine. One of Maine’s oldest treasures, the house is a National Historic Landmark. The secluded Longfellow Garden behind the house is an oasis of green and quiet in the heart of downtown Portland. Located on what had once been the domestic farmyard for the Wadsworth Longfellow family, the Longfellow Garden Club created the Colonial Revival style garden in 1926. A favorite respite for visitors and locals, the popular garden is open in seasonal weather. To read more about the garden, visit The Longfellow Garden page on the HWLongfellow.org website. The Brown Library serves casual readers and scholars, school children, local historians, genealogists, and professional researchers of every kind. The unrivalled collection, from the 16th to 21st centuries, is the state’s most comprehensive resource for the study of Maine and New England history. The rich and voluminous manuscript collections include personal papers, diaries, maps and the records of businesses, proprietorships and towns. Every county in the state is represented. Special collections include major photographic holdings, broadsides, postcards, railroad and engineering drawings, and the largest single collection of architectural plans in the state. Among the Library’s many treasures is the Declaration of Independence, one of 25 known copies printed on July 4, 1776. Click here for more information, hours, collections guides, and to search our holdings. The Maine Historical Society Museum features changing exhibitions and programs spanning more than five centuries of Maine life. Original and provocative exhibitions feature art, artifacts and documents that vividly bring Maine history to life. Politics, culture, sports, religion, art and business all find expression through the Society’s extraordinary collections. 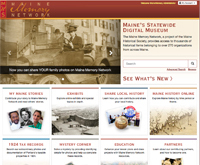 The Maine Memory Network is a free statewide digital museum, archive and educational resource that makes the rich treasury of Maine's history available to the public at large. Collecting organizations from across the state contribute historical documents, images, maps, photographs, stories, and more. The Museum Store offers unique books and gifts related to Maine history. Store items span the cultural, social, political, environmental, economical, and recreational history of Maine. With something to interest everyone, the Museum Store is open year round in conjunction with the Maine Historical Society Museum and is located in our museum building. MHS members receive a 10% discount. Museum Store items are also available online.